Finding the perfect domain name for your affiliate website can certainly prove to be challenging since there are several factors to consider. To avoid any mistakes, let’s go through some of those factors you’ll need to keep in mind when choosing your domain name for an affiliate marketing website. When it comes to selecting a niche and doing keyword research, it is important to find a niche that is scalable. This means that you are not stuck with reviewing one single product.  This plays an important part when selecting a domain name because a smaller niche, you’re restricted to only writing about that one product whereas a scalable niche has more content options. Should Your Keyword be in the Domain Name? Once upon a time, having your keyword in the domain name was major ranking factor. Today is not the case, at least this is what Google says. Here is a video of Matt Cutts (former head of web spam at Google) discussing How important is it to have keywords in a domain name. This video is from 2011 and Google has since reduced the ranking factor of having keywords in a domain name. I personally think that it still carries some weight when it come to ranking. I say this because if your keyword is in your domain name, it becomes bold in the search results. Have a look at the below screenshot. As you can see, the term affiliate resources is bold within the domain name. If it isn’t a ranking factor, then why does Google do this? So when choosing a domain name, I personally think it is OK to have your keyword in the domain name. Another option is to build your own brand. As Matt Cutts suggested in the video, having your own brand that is unique and rememberable is a good idea because people will tend to remember this. One thing you want to avoid, is having a company brand name within your domain name. This means you don’t want names such as Google, Amazon, Apple etc. within your domain name otherwise you may be facing a lawsuit from those companies as it may be infringing on their brand. Another thought to keep in mind is avoid having a product brand name within the domain. For example, Kindle is Amazon’s proprietary brand for their e-reader and if you have the term Kindle within your domain name, Amazon could come after you. What is the Best TLD? A TLD is a Top-level domain which basically means the domain name extension. For example a .com is a TLD. When I am selecting a domain name, I always try to find a .com first before looking for any other TLD’s, and if the .com isn’t available I then start looking at .org’s. In my personal experience, I find that .com and .org TLD’s tend to rank better in the search engines, but there is no official Google evidence to back this up. If you are unable to find a good domain name with a .com or .org, it means that the niche may be saturated and you will be facing an uphill battle when it comes to ranking your website. There are a variety of websites that you can purchase your domain name and each one will have their own advantages. For many years, I have personally purchased all my domain names at GoDaddy and have been very happy with their service as a domain provider. But the problem is that over the last few years, they have added a plethora of UPSELLS throughout the domain buying process which can dupe folks into buying additional products or services in which they don’t need. Even though GoDaddy has been in business for several years and have been considered the reliable place to purchase domains, a new place has emerged which is currently giving GoDaddy a run for their money. You can now buy your domains right inside of Wealthy Affiliate. This is such a breath of fresh air for several reasons and the biggest one is that there are NO UPSELLS during the domain purchasing experience. 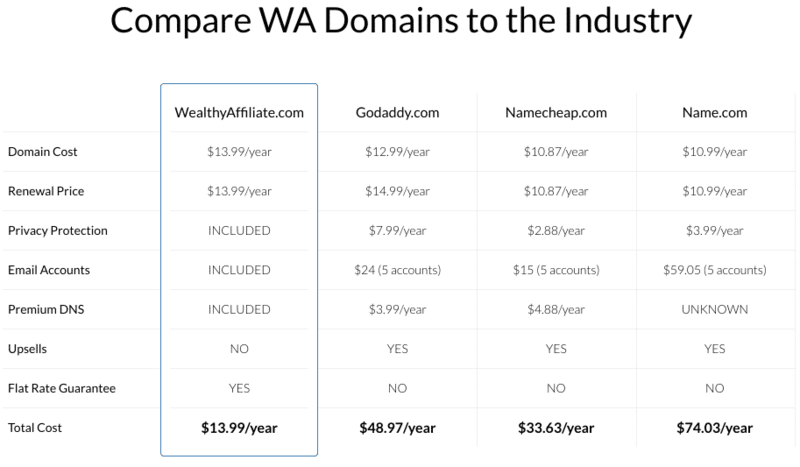 At first glance at the cost of the domain prices within WA, they seem more expensive. But upon further research, the long term costs are significantly lower. Have a look at this comparison table. As you can see, you will end up saving a considerable amount of money in the long term. Just have a look at the Renewal Prices! I suggest you buy your domains from Wealthy Affiliate as you will end up saving a ton of money AND time avoiding useless upsells. Here are a few additional suggestions to keep in mind when finding your domain name. Domain name lengthAvoid domain names longer than 15 characters as they will end up being more difficult to remember and share. Hyphens in domain nameHyphens within a domain name can take credibility away from the website and can actually be considered as a spam indicator. Length of Domain RegistrationDon’t worry about registering your domain name for 10 years as this carries no weight with a ranking factor. So the next time you’re in the market for a new domain name, make sure you keep the above factors in consideration so that you don’t end up wasting money buying the wrong domain name. I am the founder of Affiliate Resources and have been running my own successful online affiliate marketing business for over 10 years. The niches that I am involved in range from Kindle Lighted Covers to Flux Capacitor Replicas. All of which I have a personal interest in. I am also the Live Training Coach inside Wealthy Affiliate where each week, I broadcast live training classes via Webinars to their members. where should I buy the domain name and hosting for promoting Clickbank vendor’s product? is it ok if I place photos or name of the product on my affiliate website? My comment is I’m a member of WA and I’m building my website I’m right now creating pages and it’s to late to change my domain name which is edwardlarry.com, My niche is Skin Care is my name brandable and how will I make my domain an individual blog. Thanks for your guidance on “which domain is best and how to choose best niche for affiliate marketing”. i hope you have good experience in affiliate marketing and for your information i want to tell that i also know little about this as i am an internet marketing executive in a private organization. i want to earn money through affiliate marketing. so please guide me from level zero , from selecting a good niche for website to buying best domain name and extension. i hope you will reply soon with best suggestions. I appreciate your knowledge and your sharing it. This information is invaluable to all who want to earn a living online. Building a website, with all the plugins and technical stuff can be daunting. Thank you for making the road easier to travel. Thanks a lot for sharing this awesome post with us. Selecting a perfect and profitable niche is very essential to get the success. Giving some thought to each step is great advice. I like this post it really helped me take note of tasks and specific names are given. I think the promoted words mean alot. I only wish my first domain name purchase had been my last. As I am starting to change to online marketing in search of success. Good info for me here. Don’t worry about buying additional domains as they are assets in which you can use to resell or create small micro niches. I agree with the keywords in domain name bit 🙂 It worked for me so far and for any future projects, if I don`t have strong feelings about creating a Brand, I will again go for keywords. Most people don`t care what website they go to as long as the information is there. 1. I already have a website for my company , should I just Add an “affiliate page “ to my menu? 2. Should I create Separate website and separate name .